I've been painting with oil and acrylics for 40 years. My first interest was surf art. I grew up in Southern California and was emersed in to the surf culture. 20 years ago we moved to Bend, Oregon......another type of "paradise" that changed the way I would paint. This submission was done in oil. The “online” version of Surfer magazine picked it up and posted it. That was very inspiring to me! I was able to sell a few of my paintings; and although I was stoked; I was still unable to get my mind's eye around the process of transparency and reflection in water. 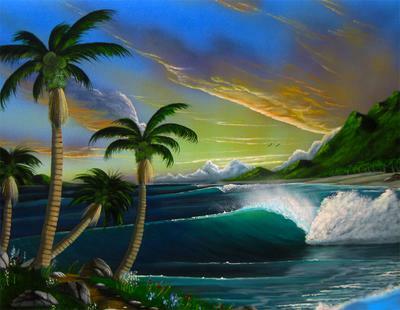 This painting is called “Paradise Cove”; and is done in oil. I know we are talking acrylics; but I thought I should show an example of where I’ve fallen short. My water looks more like “wet concrete”. See what I mean? I love it, Its Paradise, a place where most can relate to.